Which fats actually support a healthy body? Each of us needs to rethink our position on what constitutes a "healthy cooking oil". New research conducted the last ten years, as well as a new look at the data from old studies, has revealed a lot of holes in the story we've been told for the last fifty years. That saturated fats ("saturated" with hydrogen atoms), particularly animal fats, are bad for us and clog our arteries, raise "bad" cholesterol levels, cause heart disease, and contribute to weight gain, are no longer considered foregone facts. What is coming to light is just the opposite: that quality, unrefined saturated fats contribute to heart health and to weight loss! Notice we're talking "quality" and "unrefined" saturated fats here, not Crisco or margarine or any other saturated fats created in a laboratory with high-tech processes. We're talking old-fashioned butter, cream, and other dairy products from healthy animals, as well as the flesh fats from such animals, like lard, chicken skins, and the fat on your steak. In the vegetable kingdom, quality saturated fats come in the form of coconut oil, palm oil, and palm kernel oil, three fat sources that have nearly disappeared from the American diet because restaurants and food manufacturers have been pressured by mass misinformation to replace them with "healthier" polyunsaturated vegetable oils. Refined, mostly polyunsaturated, vegetable oils have few, if any, available nutrients and are actually oxidized, or rancid, and add free radicals to the body. They're unstable when heated - um, cooking usually requires heating - forming additional free radicals. These oils are an inferior source of necessary fats for the human body. Healthy cooking oils are natural and whole foods complete with a nutritional profile (i.e. contain bio-available nutrients), are a product of nature, not the laboratory, are stable when heated, and have a long tradition of use by healthy populations. Modern vegetable oils are none of these things. Blaming saturated fat for heart disease "is the greatest biomedical error of the twentieth century." Additionally, high-fat diets are only correlated with obesity and heart disease when the fats ingested are refined vegetable oils. 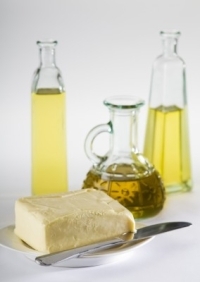 Ingestion of natural saturated fats actually promotes weight loss and better heart health! And protects against other health risks like cancer and diabetes. This is a stunning reversal of the story we've been told for so many years, and if you're like me, it will take some time for it to settle into your mindset. We've been told by the experts for so many years that fat makes us fat and unhealthy, and that vegetable oils are the healthiest fats, I found I had a real fear of saturated fat to overcome. But read up on the newest information (there are some links below) and see what your gut tells you. Apply your own good sense, and your sixth sense. Then, in order to know for sure, gather your own experiential evidence. That's what I did and was amazed at the results. Not only did I NOT gain weight, but I felt better in unexpected ways. Unexplainable feelings of depression and overwhelment disappeared. Tiredness and an inability to get simple things done went away. My body temperature came up to normal and the ability to properly regulate body temperature, both in hot and cold environments, returned (symptoms of my underactive thyroid). You can read my story at Effects of Saturated Fat. But gather your own evidence by giving it a try. Buy some butter, organic if possible, and begin using it the way you've always craved, on toast, baked potatoes, for sauteeing veggies, on oatmeal and on corn on the cob...let your vegetable oils sit in the cupboards untouched. Not only will your food taste better, but you'll feel satisfied and full longer, and you won't gain weight. Part of what saturated fats do is satiate. They fill us up. Any diet that leaves you feeling hungry is a diet bound to fail. If not today, then tomorrow. And that's what empty fragmented nutritionless foods do to us, leave us reaching for more to eat. Butter and coconut oil are particularly great fats because they're comprised of mostly short- and medium-chain fatty acids, a rarity in the world of fats. What makes medium-chain fatty acids so special is that they are more likely to be burned as energy than to be stored as fat. They also have anti-microbial properties, and butter has a slew of necessary vitamins. Three of the best healthy cooking oils. The three healthy cooking oils I use regularly are butter, coconut oil, and olive oil. Are they the only healthy ones? No, but they're the ones readily available to me, at a reasonable price, and of good quality. For a breakdown of other healthy fats, see the bottom of the page at health-report.co.uk. The preparation and use of butter is a centuries old practice. Speaking of its valuable content of vitamins A, D, E, and K, Sally Fallon states in Nourishing Traditions, "Butter is America's best source of these important nutrients. In fact, vitamin A is more easily absorbed and utilized from butter than from other sources." Butter is stable at cooking temperatures, although the milk solids can burn. To remedy this, a little olive oil can be added to the pan or you can use clarified butter or ghee, from which the milk solids have been removed. Soft butter for spreading is a must in my house, so a stick is always in the cupboard, away from light and dust. If you prefer a fancier arrangement, butter crocks are available for room temperature storage. Salted butter will keep longer than unsalted - the salt acting as a preservative, inhibiting the growth of unwanted organisms. Coconut oil has a couple of characteristics that require some familiarity to master. Firstly, the intense coconut flavor of the unrefined oil doesn't marry well with all foods. The first (and only) egg I fried in it was very difficult to eat, indeed. But you might be surprised at the number of foods with which it blends well. I like it fine spread on toast or used for a rice saute, and it works great in baked goods. While purists might disagree with me, I keep a second jar of deodorized coconut oil for those times I really don't want the flavor of coconuts, like skillet-fried potatoes. Even with the extra refining step, deodorized coconut oil still retains most of its healthful properties. Secondly, coconut oil has the unique property of being liquid above 76 degrees and solid below 76 degrees, so if the temperature of your home varies as much as mine does season to season, your use of coconut oil may vary from season to season as well. Adding it to a salad dressing works well in the summer when it's a liquid, but spreading it on toast works better in the winter when it's a solid. Fortunately, it works great for stove-top cooking in either form. And don't forget a jar of fragrant, high-quality coconut oil for the bathroom. There is no equal to coconut oil as a skin moisturizer, where its anti-microbial and anti-fungal properties are a boon as well. For many, coconut oil used as a daily skin moisturizer controls keratosis pilaris (little bumps on the upper arms and thighs). Unlike the unstable polyunsaturated vegetable oils, olive oil is mostly monounsaturated, which is more stable both on the shelf and under the heat of cooking. But because it is comprised mostly of long chain fatty acids it can contribute more to weight gain than butter and coconut oil, which are short- and medium-chain. Select an olive oil with the least amount of refining and processing so it'll have the greatest number of natural nutrients. This translates to "extra virgin cold-pressed". And if you can find it, unfiltered is better yet. Look too, for a golden color instead of the green that indicates the olives weren't fully ripe. See for yourself what the new studies are exposing about the fats in our diets. Set aside the mainstream hype we've all been conditioned to believe and listen for your own guidance. 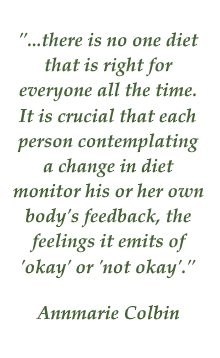 We have to be our own advocate when it comes to food decisions. Get the facts on the world of fats and oils from a leading lipid biochemist, but in easy to understand language. Enig knew as far back as 1978 the detrimental effects of trans fats and fought to educate and protect consumers. In this book, she shares her wealth of knowledge on the biochemistry of fats. This book explains, in simple language, the biochemistry of fats, why our bodies need saturated fats, and the importance of cholesterol to a healthy body. She offers an explanation for how "science" led Americans to fear fat. In her promotion of real and wholesome foods over the modern industrial foods, Planck discusses the long-held myth that saturated fats are "bad" for us. While mostly a cookbook for whole foods, one of the major premises of the book is the inclusion of healthy saturated fats in the diet. There is a whole chapter devoted to the discussion of fats which is available online at health-report.co.uk. health-report.co.uk Read this first! This is an excellent summary of the topic of healthy vs. unhealthy fats. It is a reprint of the chapter on fats from the book Nourishing Traditions (see above). coconutoil.com This is an article entitled Could Eating Saturated Fats Save 1 Million Lives per Year? Under the Research tab, you'll find a large selection of both mainstream articles and technical research papers on fats. westonaprice.org This link will take you to the page entitled Know Your Fats. On that page, scroll down, and you'll find more links to lots of articles about fats. And browse the Weston A. Price site, there's tons of valuable information there! cookingforengineers.com Another article, written by an engineer, about the benefit of saturated fats and a somewhat detailed description of the chemistry of fats. Discusses the relationship of saturated fats, cholesterol, and heart disease. coconutresearchcenter.org Get information on the value of coconut oil. Halfway down this linked page is a very long list of known health benefits derived from coconut oil. Information on fasting especially geared toward the beginner. Important guidelines on fasting including the contraindications and how to do a simple one-day fast. Confusion seems to arise as to whether this site promotes meat-eating or veganism. Let's set the record straight and talk about ideal diets. Ideal for whom? Each of us individually. The information on this site is not intended to replace the advice of a health professional who is familiar with your individual health-related issues. Copyright© 2008-2019 AllAboutFasting.com. All rights reserved.